Around 1300 CE, peoples in present-day Transvaal began to coalesce into three main linguistic and political groups, including the Batswana. 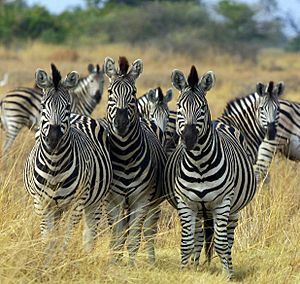 The Batswana (plural of Motswana), a term used also to denote all citizens of Botswana, remain the country's major ethnic group today. Prior to European contact, the Batswana lived as herders and farmers under tribal rule. As groups broke off and moved to new land, new tribes were created. Some human development occurred before the colonial period. During the 1700s, the slave and ivory trades were expanding. To resist these pressures, Shaka, the king of the Zulu Empire, mobilised an army. Conquered tribes began to move northwest into Botswana, destroying everything in their path. 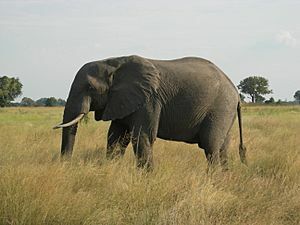 In their efforts to re-establish themselves at the end of this period, tribes began to exchange ivory and skins for guns with European traders, who had begun to reach the interior. Christian missionaries sent from Europe also spread to the interior, often at the invitation of tribal chiefs who wanted guns and knew that the presence of missionaries encouraged traders. By 1880 every major village had a resident missionary, and their influence became permanent. 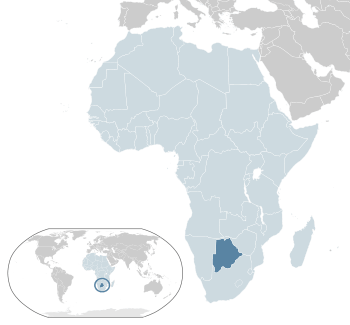 Christianization was completed in Botswana under the reign of king Khama III (reigned 1875–1923). 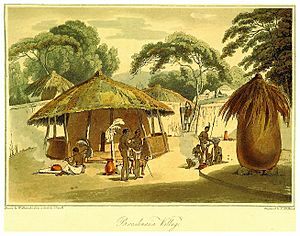 There were eight principal tribes (or chiefdoms); the dominant was the Bangwaketse. 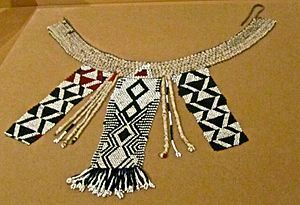 In the late nineteenth century, hostilities broke out between Tswana inhabitants of Botswana and Ndebele tribes who were making incursions into the territory from the north-east. Tensions also escalated with the Dutch Boer settlers from the Transvaal to the east. 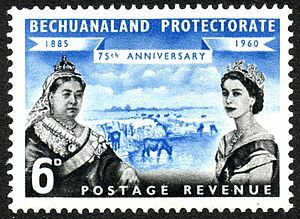 After appeals by the Batswana leaders Khama III, Bathoen and Sebele for assistance, the British Government put Bechuanaland under its protection on 31 March 1885. 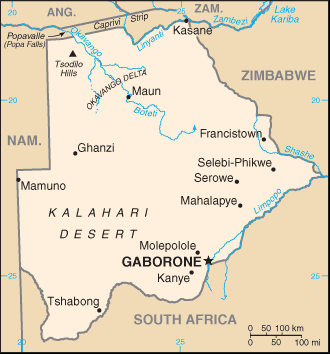 The northern territory remained under direct administration as the Bechuanaland Protectorate; it gained independence as modern-day Botswana. The southern territory, British Bechuanaland, became part of the Cape Colony and is now part of the northwest province of South Africa. 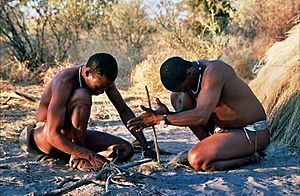 The majority of Setswana-speaking people today live in South Africa. 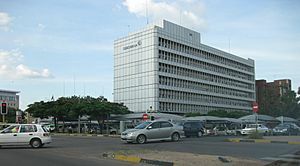 Since independence, Botswana has had one of the fastest growth rates in per capita income in the world. Botswana has transformed itself from one of the poorest countries in the world to a middle-income country. Although Botswana was resource-abundant, a good institutional framework allowed the country to reinvest resource-income in order to generate stable future income. By one estimate, it has the fourth highest gross national income at purchasing power parity in Africa, giving it a standard of living around that of Mexico. Botswana imports refined petroleum products and electricity from South Africa. There is some domestic production of electricity from coal. In Botswana, the Department of Mines and Mineral Resources, Green Technology and Energy Security, led by Hon Sadique Kebonang in Gaborone, maintains data regarding mining throughout the country. Debswana, the largest diamond mining company operating in Botswana, is 50% owned by the government. 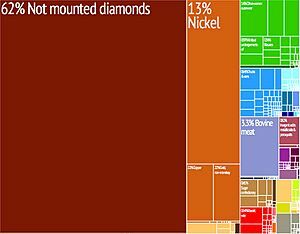 The mineral industry provides about 40% of all government revenues. In 2007, significant quantities of uranium were discovered, and mining was projected to begin by 2010. Several international mining corporations have established regional headquarters in Botswana, and prospected for diamonds, gold, uranium, copper, and even oil, many coming back with positive results. Government announced in early 2009 that they would try to shift their economic dependence on diamonds, over serious concern that diamonds are predicted to dry out in Botswana over the next twenty years. Fewer than 10,000 San people are still living their traditional hunter-gatherer way of life. An estimated 70% of the country's citizens identify as Christians. Anglicans, Methodists, and the United Congregational Church of Southern Africa make up the majority of Christians. There are also congregations of Lutherans, Baptists, Roman Catholics, Latter-day Saints (Mormons), the Dutch Reformed Church, Mennonites, Seventh-day Adventists and Jehovah's Witnesses in the country. In Gaborone, a Lutheran History Centre is open to the public. 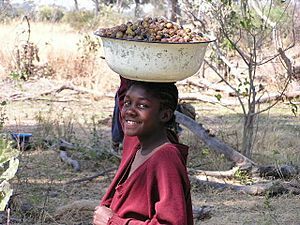 Besides referring to the language of the dominant people groups in Botswana, Setswana is the adjective used to describe the rich cultural traditions of the Batswana—whether construed as members of the Tswana ethnic groups or of all citizens of Botswana.In Botswana most of the tribes have different ways that they use to greet one another, but for easy communication and connection batswana use a three way hand shake or one can just greet another by saying "Dumelang" as a way of saying "hello" without having to use hand shakes. In community celebrations like Dikgafela or during marriage ceremonies batswana women show exitement and happiness by the use of ululations as part of their culture. 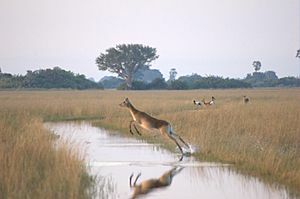 Botswana music is mostly vocal and performed, sometimes without drums depending on the occasion; it also makes heavy use of string instruments. Botswana folk music has instruments such as Setinkane (a Botswana version of miniature piano), Segankure/Segaba (a Botswana version of the Chinese instrument Erhu), Moropa (Meropa -plural) (a Botswana version of the many varieties of drums), phala (a Botswana version of a whistle used mostly during celebrations, which comes in a variety of forms). Botswana cultural musical instruments are not confined only to the strings or drums. 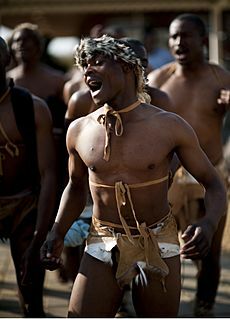 the hands are used as musical instruments too, by either clapping them together or against phathisi (goat skin turned inside out wrapped around the calf area; it is only used by men) to create music and rhythm. For the last few decades, the guitar has been celebrated as a versatile music instrument for Tswana music as it offers a variety in string which the Segaba instrument does not have. It is the outsider that found a home within the culture. The highlight of any celebration or event that shows especially happiness is the dancing. This differs by regime, age, gender and status in the group or if it's a tribal activity, status in the community. The national anthem is Fatshe leno la rona. Written and composed by Kgalemang Tumediso Motsete, it was adopted upon independence in 1966. 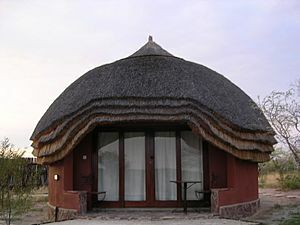 The cuisine of Botswana is unique but also shares some characteristics with other cuisine of Southern Africa. Examples of Botswana food are pap (maize porridge), boerewors, samp, vetkoek (fried dough bread) and mopani worms. 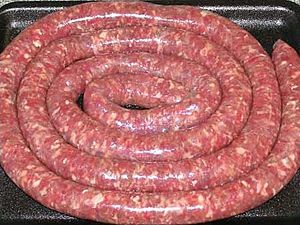 Foods unique to Botswana include seswaa, heavily salted mashed-up meat. Botswana Facts for Kids. Kiddle Encyclopedia.